It is with deep regret that I announce the closure of Whitechapel Bell Foundry, the world’s most famous bell foundry and Britain’s oldest manufacturing company. Below you can read my interview with Alan Hughes, the last in a line of bell founders stretching back to 1420, who will retire next year at sixty-eight years old when the foundry closes in May 2017 and the building is sold – meanwhile, negotiations for the future ownership of the business are underway. 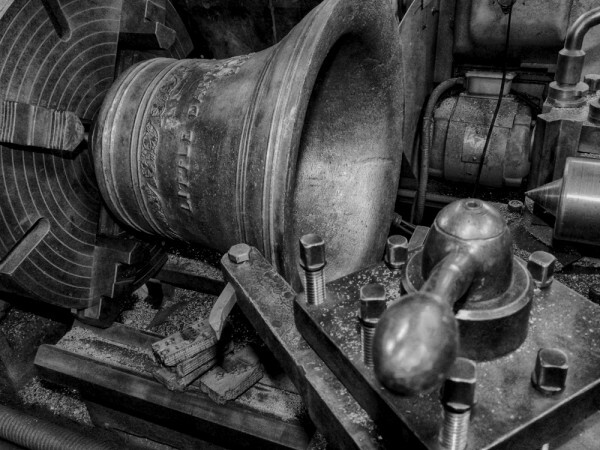 If I confide that my favourite sound in all the world is that of bells pealing, you will understand why the Whitechapel Bell Foundry became such a source of fascination to me over all these years. Every time I walked past the ancient foundry walls (the oldest manufacturing company in the land – founded in 1570), I wondered about the alchemical mystery of bellfounding taking place inside. 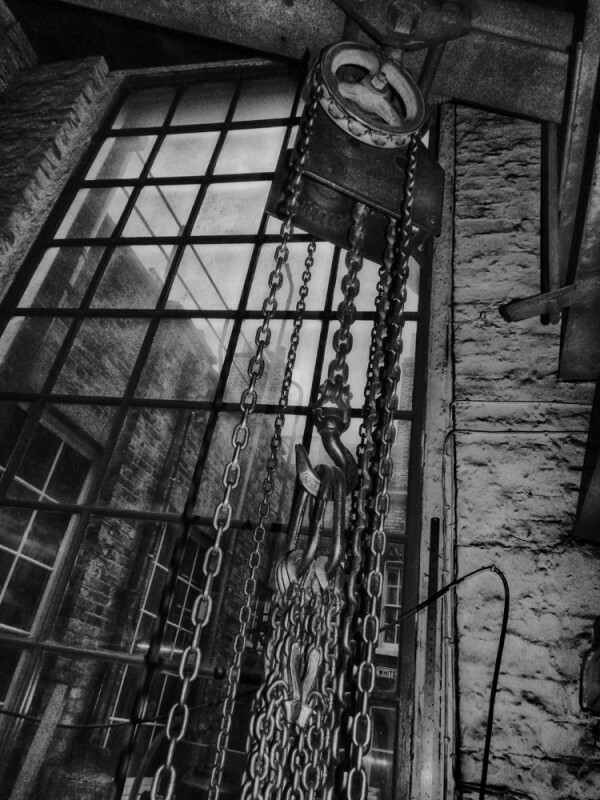 One day as I passed, walking down from Spitalfields to the Thames, the steel doors at the rear were open and, peeking in from the harsh sunlight outside, I was afforded a tantalising glimpse of huge bells glinting in the gloom of the engineering shop. So you can imagine my excitement when I received the invitation to meet the current master bellfounder in an unbroken line of master bellfounders that stretches back to 1420. 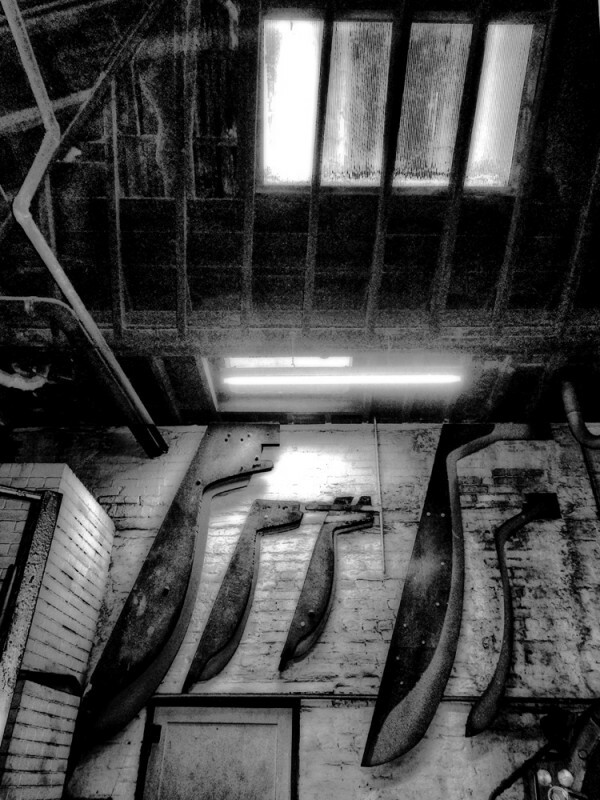 Stepping inside, out of the rain in Whitechapel Rd, I found myself in the foundry reception lined with old photographs and compelling artifacts, like the wooden template (displayed over the entrance as if it were the jaws of a whale) that was used when Big Ben was manufactured here. Among all the black and white photos, my eye was drawn by some recent colour pictures of a royal visit, with Her Majesty in a vivid shade of plum and Prince Philip looking uncharacteristically animated. I was thinking that the bell foundry must work a powerful magic upon its visitors, when a figure emerged from the office and I turned to shake the hand of Alan Hughes, the master bellfounder. 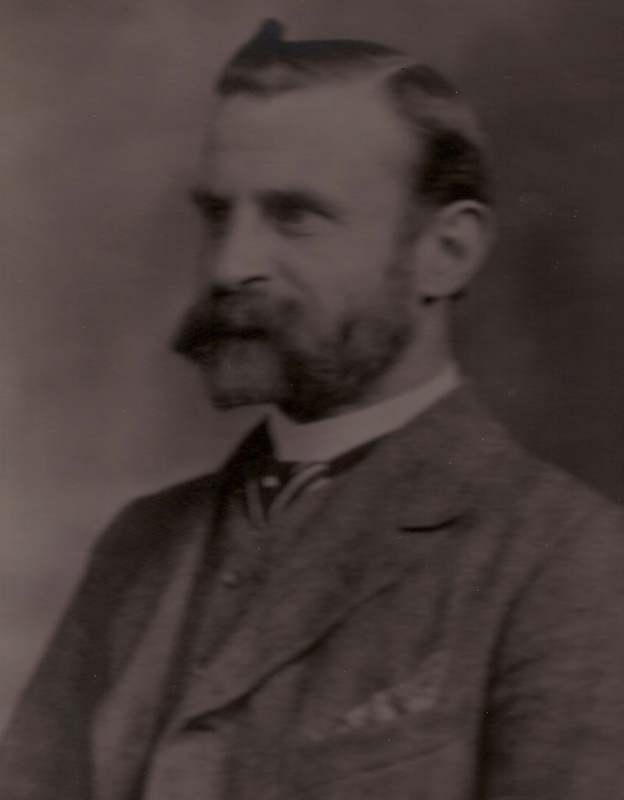 Alan’s great-grandfather Arthur Hughes bought the business in 1884, which makes Alan a fourth generation bellfounder. A sense of awe filled me as I shook hands with this unassuming man in a natty blue suit but I composed myself as best I could, while he led me through a modest office where two people worked behind neat desks and one of those fake cats dozed eternally in front of the stove, to arrive in the boardroom where a long table with a red cloth upon it occupied the centre of a modest but elegantly proportioned Georgian dining room. We drew up chairs and commenced our conversation as the Whitechapel drizzle turned to dusk outside. Alan’s fine manners and levity kept me guessing whether everything he said might actually be a proposal, as if he was simply trying out thoughts to see how I would react. I took this as an indication of courtly assurance. Alan wears his role with the greatest of ease, as only someone born into the fourth generation of an arcane profession could do, and I wondered if the royal visit might have been an occasion for mutual recognition between those born into long-standing family businesses. Up above, I could hear music. It was Alan’s daughter and her friend, both music students, practising the piano and the trumpet. The prevailing atmosphere was that of a work place yet it was domestic too. When Alan’s predecessors set up the business on this site, before the industrial revolution, they attached the factory to the house so they could walk from the dining room into the foundry at their convenience. The feeling today is akin to that of the quiet living quarters of an old college or liturgical institution. Tentatively, I asked Alan what it meant to him, being part of this long line of bellfounders. Alan searched his mind and then said, “I don’t think about it very often. I would like to meet some of those people, Thomas Mears (master bellfounder from 1787) who would know the place today and Thomas Lester (master bellfounder from 1738) who had this part built. It would be nice to have a conversation with him. He would recognise most of it.” Then the gentle reverie was gone and Alan returned to the present moment, adding, “It’s a business,” in phlegmatic summation. “Our business runs counter to the national economy,” he continued, “If the economy goes down and unemployment rises, we start to get busy. Last year was our busiest in thirty years, an increase of 27% on the previous year. Similarly, the nineteen twenties were very busy.” I was mystified by this equation, but Alan has a plausible theory. 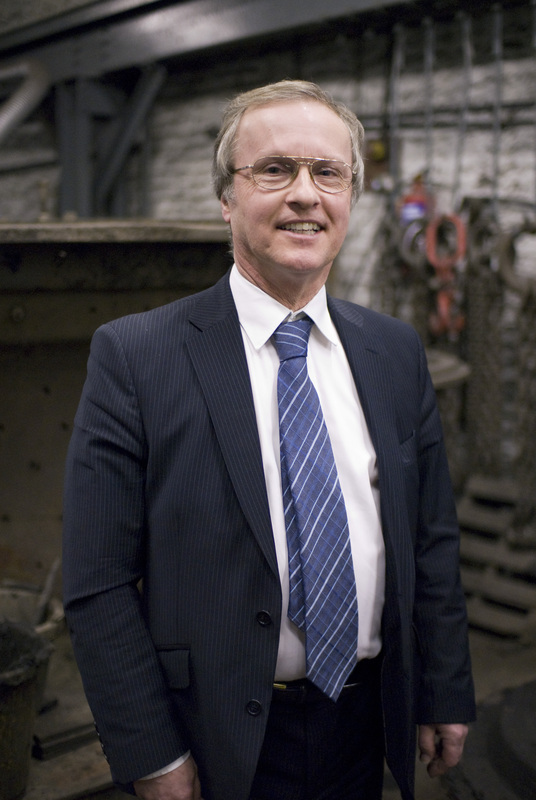 Alan broke into a huge smile of wonderment at the nature of his world and it made me realise how important the continuity between the generations must be, so I asked him if there was pressure exerted between father and son to keep the foundry going. The implications of Alan’s conclusion are startling for him personally, even though he has many years to go before eighty. “You’re a very eloquent man,” I said in sober recognition, “No, I’m not!” he retorted cheekily. “You have such interesting things to say,” I replied lamely, “No, I don’t!” he persisted gamely, obstinately raising his eyebrows. Nevertheless, Alan’s life as a bellfounder is remarkable to me and maybe to you too. Seeing his life in comparison to his predecessors, Alan embraces the patterns that prescribe his existence, for better or worse, and his personal mindset is the result of particular circumstances, the outcome of four generations of bellfounding. Alan has my greatest respect for his immodest devotion to bells. I am a bell-ringer in Auckland, New Zealand in St Matthew’s in the City. 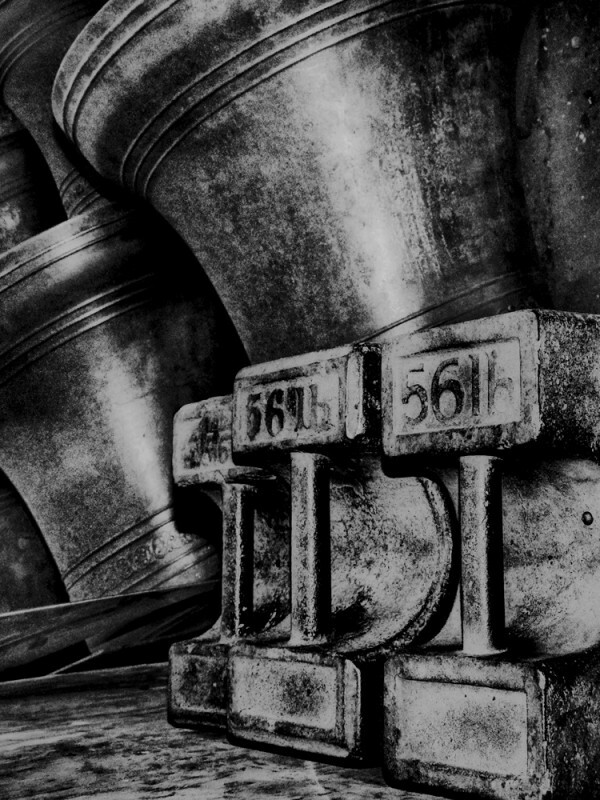 Our set of 8 bells was originally founded by John Warner and Sons in 1862 in Spitalfields, but they were restored at Whitechapel Foundry in 1971. Our bells are known as Bishop Selwyn’s Bells, as he was responsible for originally bringing them to New Zealand. The closing of Whitechapel Foundry has a special connection to us. I’m very sorry to see it go. Beautiful and poignant article. 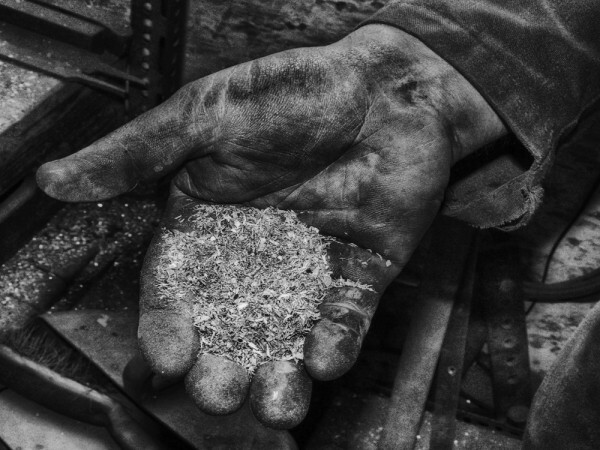 Excellent photos which capture the atmosphere and history of the foundry. Thank you. Oh I was so very sorry to read that the Bell Foundry is to close. It has been on my list of places I really want to visit for a while now. How do I go about getting the opportunity to go there before they close please? I confirm that we have indeed accepted an offer for the premises which we will vacate in May. And I confirm that Alan Hughes has decided to retire. BUT I also confirm that negtiations are in place with potential purchasers for the business of the Whitechapel Bell Foundry Ltd which is a completely separate issue from the sale of the premises. We do indeed sincerely hope that these negotiations are allowed to continue and will conclude with a move to new premises for part or parts of the business. We continue to be open. Kathryn Hughes, Whitechapel Bell Foundry Ltd.
Once met a chap in the RAF he said ”I once worked in the old bell foundry”, he was proud of it. Hope; best of the Company records and some hardware will be sent to a industrial section of a museum somewhere. John – PS GA please keep us posted on any future development’s on assets and Company movement direction. !Time up for whom the bell tolls on this great Company. How sad.. I would pass this iconic landmark regularly on my way to and from school at Aldgate in the ’60s. I imagined it had many stories within its sturdy walls, and it would be there forever-and-a- day standing stately, as the world rushed by, a monument to bygone times of artisans & craftsmanship. So long.. Does Allen not have a son to carry on the business?It would be a crying shame to see no one carry on.Presumably the building is listed.Very interesting article. He is every bit as precise, charming, unassuming and fascinating as you describe. You couldn’t wish to meet a more delightful gentleman. It is good to hear that he will be able to enjoy a very well deserved retirement with his family. I hope it will be possible to continue the foundry as a going concern elsewhere. No! This feels like the absolute beating heart of the area is being ripped out. I’m surprisingly upset about the possible end of this wonderful and historic company. It has taken me by surprise to realise just how sad it makes me to hear that it may come to an end. I used to work at The John Cass’s C of E Foundatin Primary School atAldgate for ovr a decade. We took the children to the foundry on numerous occaisions. It was an amazing link with the past and one of the highlights of the pupils’ local history study. What a shame it will be if there is nobody to carry it on after almost 700 years of it being an import part of the ecconomic and religious life of London and beyond. 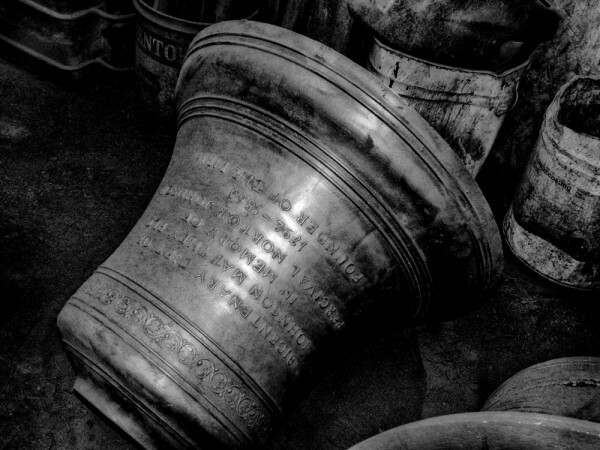 I remember a bell being cast to be hung in the school hall as part of a special anniversary and the pride and pleasure staff and children felt both as members of a historic school and that the bell had been made at ‘our’ local foundry. A big THANK YOU to Alan and staff for there work and wishing him a happy retirement, if our thoughts can be passed on to him. Here’s hoping that somebody does indeed decide to buy the business and carry it on. If there is any chance that the foundry does not continue in its present location–and Kathryn I heartily hope it does–surely it needs to be listed and turned into a museum? A place with this much history cannot be struck down. I am the proud owner of a handbell from the Whitechapel Bell Foundry which is inscribed with my name and dates of service with the Metropolitan Police. It is a tradition that retiring officers from east London are presented with a bell on their retirement. It’s a very prized possession and I’m so sad to read this news. I was fortunate enough to get a place on one of the tours of the foundry about 10 years ago (we had to wait almost a year for our slot to come up!) and it is one of the most memorable experiences I have had. Apart from seeing the furnaces, bells cooling and (of course) the fascinating internal architecture of the buildings one moment was particularly evocative. The foundry not only makes bells but also refurbishes them and in their loading bay were bells which went back, iirc to medieval times which needed attention. To think that in the 21st century you might be working with artefacts which could have been cast hundreds of years before is astonishing. Anyway, this is indeed sad news and I hope that at least the art of bell making, even if it moves to an industrial estate somewhere else, keeps going. I’ll put some of my photographs from that visit up at my website. My father used to bring his students from Christ’s Hospital Horsham to visit the foundry. He used to talk so highly about about what a wonderful place it is. So very sad to hear about the closure. This must resonate with in so many parishes around the country – and even the world. It’s sad to hear that they are selling up, despite having a good year. Perhaps they will continue somehow. I wish you could tell us. By the way, the Japanese would never let an old valued business with this skill close. It would be a national monument and the people in it deemed national treasures! I heard the news yesterday from the foundry as I had called to ask about the commissioning of a new bell. A life long love of bells, decades of fascination passing the foundry almost daily and finally the moment when I would commission a bell from the very place. The foundry was very matter of fact and whilst I spluttered with incredulity they explained how they would still be able to oversee the commission through the coming changes. Very sad a new bell won’t have ‘Whitechapel’ cast into it. Lovely article, but what a shame. I would be interested to know if there are any other bell foundries in the British Isles or if the nearest one now is Villedieu le Poeles in Normandy? It was a great privilege to see the new peal of bells for our Abbey in St Albans a few years ago; they were ranged in the main body of the Abbey for a short while before they were hung. Now hung they sound beautiful and it was a pleasure particularly to hear them play ‘Chariots of Fire’ each time a Brit won a gold medal at the London Olympics. I trust that Alan will enjoy his retirement; I reckon he has earned it. I also wish the family well in their attempts to assure a continuation for this fabulous business that is so much part of our heritage. Anyone who can must tweet/facebook/etc this important article. We must band together to find someone to buy it and keep it going. I’ve always enjoyed the “romance” of old Victorian Whitechapel that the foundry kept within the fast changing area. Lots of happy memories of talking about what it must’ve been like inside with the girlfriend when we walked past. Always thought we’d get inside one day. Very sad to see it go, hopefully whatever moves in is sensiive to the history. As an American this makes me sad because one of our most precious icons, The Liberty Bell, was made there. Thank you for being a bellweather to 500 years of mondern history. This is such a crying shame. Far too many of our interesting buildings & trades are closing or being demolished. Could it not be made into a museum? Sad sad news. I remember communicating with the foundry from Australia over 30 years ago – over a broken handbell. 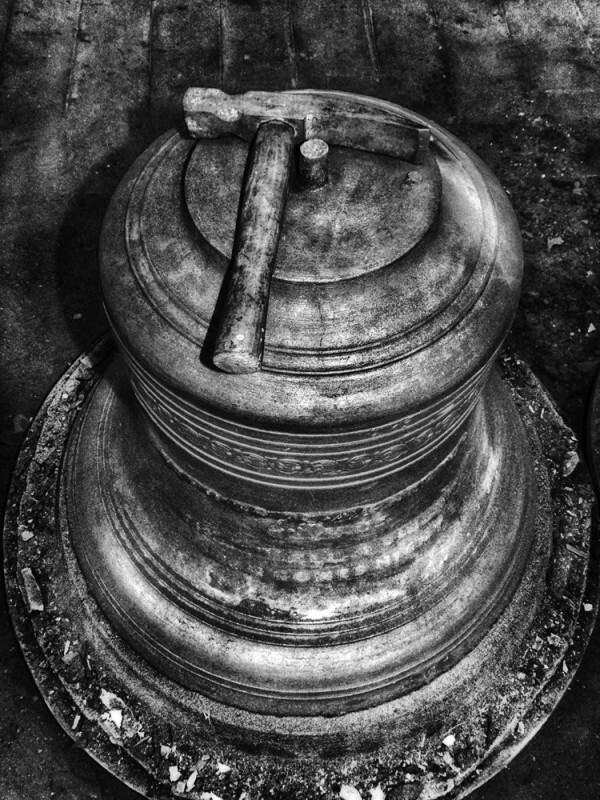 And now based in London for over 25 years I’ve walked past it many, many times and felt a particular connection to a seemingly eternal cycle of bell creation. I hope the business can continue but am sad that it will not be in Whitechapel. How very sad the foundry is leaving Spitalfields. I hope the premises won’t be purchased by an uncaring billionaire and converted into luxury flats. “Ring the bells that still can ring”. This posting touches so many kindred notes. reading the interview and trying to grasp the concept of a fast-moving world, seemingly spinning away, leaving such greatness behind. I was especially touched to read that retiring policemen were given engraved bells……Goodness, what special and unique treasures. So sad to hear this.Both my sisters trained at the London Hospital in the late 1970′s so passed it regularly when visiting them. I started bell ringing a year ago,and love it,but also love the history of it all. This is simply terrible news. The whole site should be preserved as a national monument of worldwide interest. This is now a matter of great urgency. Can nothing be done? I assume the buildings on Whitechapel Road are listed but what about the foundry? While millions are squandered on the execrable Garden Bridge this essential and lovely piece of the capital’s heritage will be swept away. We cannot allow this to happen. Ian Nairn loved the place. This is a sad day. What is to become of the site? It should be conserved as an historic site and museum. This is a a legacy we cannot lose, a blue plaque on the wall outside is not enough. Thank you to the Hughes family for continuing this tradition to the present day. Terribly sad..best wishes to the owners and respect for a hard decision. The building should be listed Grade 1* The Mayor of London should step in to save it from property developers knocking it down. A very sad sign of the times …. great shame. A huge loss to the area of Whitechapel and yet another piece of London history eroded. The black and white photographs with this post are especially poignant. Beautiful. Makes me heartsick that it is going, though. I once has the privilege of going on a tour, shown round by Alan Hughes on a Saturday when the foudry was quiet. I was the muggins who asked “How many people work here”, to which he replied “most of them”. It’s terribly sad to see it go. However, Mr Hughes pointed out that in mediaeval times, all the bell founders of the City of London worked in the City itself in a small area near Fenchurch Street, and the current foundry moved to spacious new premises on the the site of a former coaching inn at Whitechapel. So perhaps the time has come for it to move again to even more spacious premises on an industrial estate somewhere. It would make sense for the sort of operation it is. 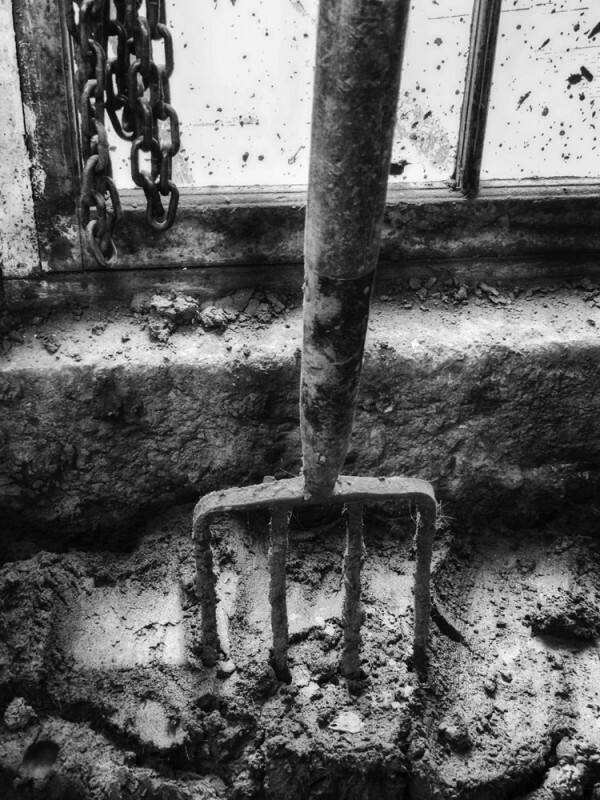 I just hope that the site is redeveloped sensitively and that the old tools and atrifacts either continue in use or are preserved as museum pieces. I was privileged to be among a group of ringers from the US that was welcomed to the foundry by Alan and Kathryn in July of 2007. Alan most kindly and patiently gave us a fascinating tour after which Kathryn welcomed us to the living quarters with a beautiful reception. The visit was definitely a high point of the entire trip. I am sad to hear that this wonderful historic site will be closing, but am so grateful to have been there and therefore be a very very small part as was everyone who entered over the centuries. I hope the tradition of Whitechaple bells will continue in some form. Very sad to hear this news. I cam in and met Alan and Kathryn earlier this year and they were as gracious as the Gentle Author describes. I was interviewing as I was writing one chapter in a book about the world’s oldest companies. That book ‘Established’ is now written (12 authors, each taking one old company, asking ‘How on earth did you do it?’) and will be published by Unbound in autumn 2017. Now my chapter will need a footnote at the very least. Glad to hear that the business will continue but impossible to imagine the business outside its very special East End location. 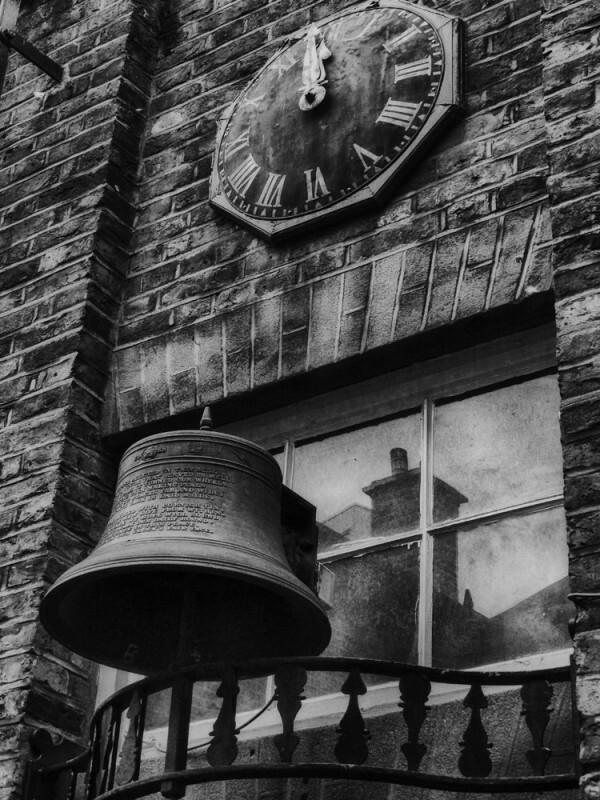 So much of London’s history is forged by its bells. I wish Alan and Kathryn all the best (understanding that they and their daughters wish to pass on the baton). The workforce, with their special, traditional skills, deserve a grateful thought and wishes for their future. So VERY SAD, we continue to lose more historical culture from THE EAST END , will it ever have the magical present, as the past fades into once upon a time. With every chime of BIG BEN let it be a THANK YOU ! Very sad but hopefully whoever takes over will feel passionate about keeping the bell foundry as it is and maybe even making it into a museum so it’s history and heritage will go on for all to see. How fortunate I feel that we were able to visit the White Chapel Bell Foundry this October, having gotten the bug to do so from reading Spitalfield’s Life. While we didn’t have a tour, Kathryn gave us much of the story, showed us pictures and shared a bit of the family story; she was very generous with her time. We sampled many bells in the shop and came away with a table bell for ourselves and a ship’s bell as a gift for friends, whom coincidentally we are meeting tonight to gift the bell. I’ve just yesterday ordered a table bell for my father for Christmas, as he admired ours over Thanksgiving dinner. Funny how, because of its endurance, we presume something as old and rooted in London history will last on. We had hoped to tour the Foundry in June when we are next in London. I so hope there is a new location to visit. Good luck with the sale of the business to someone and somewhere for another 200 plus years! This news came as a great surprise. My connection with Kathryn and the Foundry happened only this year when I was making arrangements on behalf of Cantabile Ladies’ Choir in north Wales to have our handbells refurbished. Our representatives who took the bells down to Whitechapel had a warm welcome from Kathryn and thoroughly enjoyed their visit. I’m so glad that the family has managed to find a potential new purchaser for the company, even though it must be a great wrench for them after so many years. All the best in your retirement. What sad news. Like many other people who have left messages here, I have been lucky enough to go on a tour of the Foundry. Can all this support somehow be translated into a real and effective effort to preserve the works? I’m sure it would make a wonderful museum; the Coffin Works (www.coffinworks.org) in Birmingham is an example of a place that has made a very successful transition. Goodbye old London, home and birthplace of my ancient family. The language, the buildings, the people, the spirit….all sad goodbyes. This is not the end of an era but could be the end of something that has survived many eras. I had an amazing insight into the work of the foundry when they recast the bells of the parish church in my home town in Derbyshire. I do hope that something will be done to save or preserve this unique piece of our industrial history. The article is so fascinating and quite appropriate for me as my own Church Bells were cast there. This is extremely sad news which we only heard today. It is perhaps more remarkable that such heavy manufacturing industry carried on at this site for so long: the bell foundry can with apparent justification claim to be London’s longest-established manufacturing firm. 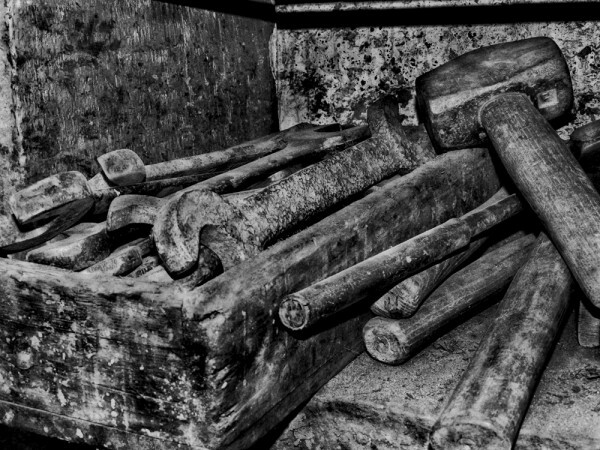 The Survey of London is working on a big Whitechapel history project and we have had very kind assistance from Alan Hughes in doing our research on the foundry, some of which, along with photographs, plans and pieces of film, including an interview with Alan, is on our interactive Whitechapel map – https://surveyoflondon.org/map/feature/155/detail/ to which you can also contribute memories and photos of Whitechapel. I am so sorry to hear about the closure of this bell foundry. I feel privileged that I was able to visit the foundry about three years ago and it remains in my memory one of the outstanding visits I have made anywhere. A very sad announcement for all ringers whether tower or handbells. Wishing those who’ve given us so much joy a very happy retirement. This is sad. But as Alan said, the foundry has moved trough many hands over the centuries, and this a new opportunity and direction for the new owners. I will miss the property if the foundry actually moves, but I do hope the store front and buildings are saved. Lovely people the Hughes! Thanks for this – I found out through “Londonist”, before my daily read of this blog. I’m going to forward this article to several people – some of them Ringers. How sad. I visited the bell foundry a couple of years ago, with a party of red hat ladies. It was so interesting. I think my Grandfather worked there in the 1920′s. I hope Alan has a long and happy retirement. Stepney has lost another piece of history. I do hope that the business doesn’t end up in India or China. GA, I’m very concerned, what on earth has happened to Aachem? And why should a son be necessary to carry on any business? 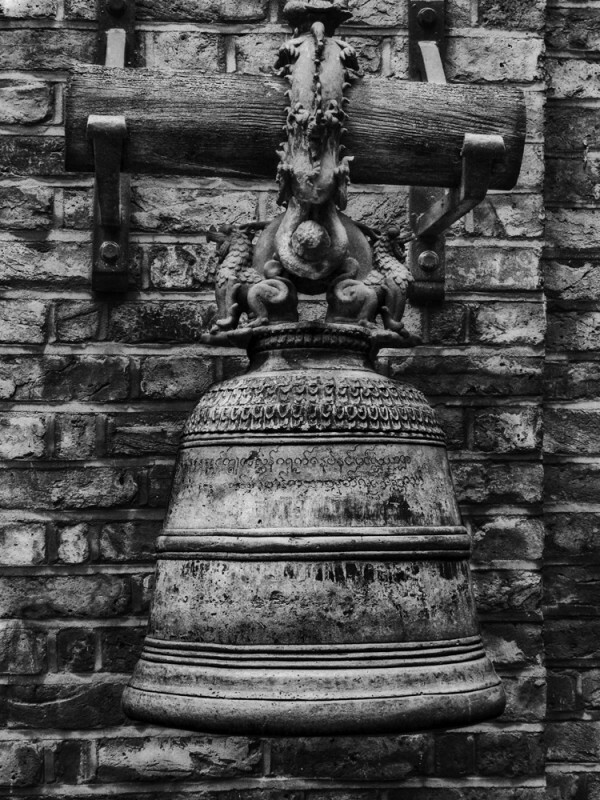 Whitechapel has a female bell founder in its history, (Joanna Sturdy) so why not another? This is the 21st century, not the 19th. Glad to see the business will continue, albeit at different premises. I wait with baited breath to see what happens to the fine old building. My ancestors lived in that area and I think about them walking past the foundry and glancing its way. I also trust that Kathryn and Alan Hughes will be happy in their new home and hope that the move was ultimately their decision. Too many times people are foisted out by greedy developers. Best wishes to you both. I have been very blessed to be a part of the handbell community for 24 years. The wonder of listening to the sounds handbells make inspires me time and again. Whitechapel bells are an integral part of my experience. I hope the foundry can be turned into a museum for future ringers of all countries and the company itself be relocated so it can continue its journey. Blessings on the retirement of the Hughes. I am so very sorry to hear this news. What a hard decision to make. You repaired our 1275 matched pair of church bells at St Swithin’s, Thorley, Isle of Wight in 1996 and we were all fascinated by the work involved and the care that you took. I own a set of your handbells and they give much joy to their players. Thank you! Sad news. As a collector of 18th and 19th century British pottery, I discovered several years ago in the Newcastle-under-Lyme Borough Museum, the “Bellringers’ Jug” from a local church. It was very large with a secondary handle beneath the pouring lip; the body was covered in black slip with colored slip ornaments; and had the names of the bell ringers scribed through the slip, revealing the white body color. A few other jugs made for this purpose survive in scattered collections. It was said that the jug was filled with beer to slake the thirst of the ringers as they pulled the ropes. Here in Connecticut, the nearby small town of East Hampton is known as “Belltown” for the many small foundries that thrived in the 19th century. Only one remains today despite a devastating fire several years ago. For those of us who played in the Little Rock Air Force Base Chapel Handbell Choir with Maj. Marybelle Nissly (Ret.) back in the mid-1970′s, you’ll know what a great loss to the world of music the closing of this foundry truly is. We were one of the few handbell choirs in the US to have the great honor of playing Whitechapel bells because our dear Marybelle insisted on getting us only the very best as part of our US Air Force heritage. As young musicians, we took great pride in our lovely bells and took care of them like the treasures they were — and are. Very sad news. My Mother’s family, the Olivers worked there for around two hundred years. As a family historian and East Ender it is quite a blow. Two years ago had the privilege of visiting the wonderful foundry and interviewing Kathryn Hughes for a radio piece for BBC World Service. I was so thrilled to be there and be made part – however briefly – of so much London history. Will try to dig up and sound cloud the piece, but so gutted to hear the foundry is closing. So much being lost, and for what? Another bit of gentrification so that rising land prices can gratify the developers, the estate agents and the City of London. I was privileged to meet Alan Hughes whilst researching the history of the Crewe town centre clock tower, clock and bells. An erudite gentleman indeed. The foundry is a remarkable place with an even more remarkable story. There’s a brass plaque given by the employees to celebrate the quatercentenary of the foundry in 1970… It bears the motto “They have neither speech nor language but their sound is gone out unto all nations”. How fitting, for such a marvellous place as this. This is so sad. Surely the building itself will be saved? This is where the US Liberty Bell was founded , and the crack occurred which is so unique and famous. I am confident the British will not allow such an historical building to be destroyed. They appreciate their history greatly. Kathryn, I’m so sorry to hear about this. It is the end of an era. Hopefully, the negotiations will go smoothly and the foundry will continue your legacy. I’ll still be writing for those Whitechapel cup bells… I’m glad I finally got the rest of that set! It won’t be the same without you and Alan at the helm. I will miss chatting with you in the HIC… fun times! Godspeed. The premises are designated as Grade II listed buildings, and as such may not be altered in any way. How sad to hear this news. My mother and I visited Whitechapel Bell Foundry around 1969 when we were doing some family tree research, and were looking for an ancestor who had reportedly worked in a London bell foundry. You were kind enough to check your records for us, and spent time talking to us, even though we had just turned up ‘on spec’. As a child, I found it a fascinating place, and the memory has stayed with me. Along with others, I hope that this iconic building can be preserved as a museum, or heritage centre for bell ringing and for Spitalfields – it would be such a shame to lose it. It is sadly discouraging to read that things may continue, yet not in the same place. Historically, it would be very wise to keep going within the same place … moving somewhere, where suddenly it most likely will be realized is the wrong location, will be the total end to something very special within our world, for many of us. Hopefully, someone will reconsider this all, and allow Whitechapel to remain where it belongs. Just a thought, inspired by saveHOVE above about some form of action to save the infrastructure. I wonder if an institution like the Victoria and Albert museum could be persuaded to buy the building and preserve it like the Soane Museum in Holborn? I wouldn’t know how to go about approaching them in this respect and I wonder if there are any luminaries who read this thread who can with our support. A museum dedicated not only to the heavy manufacture of bells but possibly other lost industries of the east end might be an attraction, especially now Whitechapel is so much more popular than it has been in past years. If anyone wants to contact me over this get in touch via my website. Heartbreaking, 70 years ago I walked up the alley beside the foundry to Commercial road where I worked at Aldgate & City motors, even then it was an old & majestic monument famous the world over & yet tucked away in a corner of the less salubrious London. Shame on our ~Nation if nothing is done to preserve this. Very good news from Kathryn Hughes. Hope it all comes to pass as planned. Sod it ! I’ve lived here since 1979 sometimes walking or riding on the 25 passed it almost on a dailyz basis. Always thinking some day I must go for one of their tours – now I’m too late !! Or am I ? Please don’t go. It isn’t just the building it’s what goes on inside that’s important. So very, very sad that such an iconic place should not be preserved for the Nation. Forget the stupid garden bridge and save the Whitechapel Bell Foundry for our children to know and love. I have total respect for the family – they will have worked very hard over the years and deserve retirement but will someone please act and buy up this institution and save it for posterity. What a shame. It is an end of an era and it must have taken a lot of soul searching to reach the decision to sell. Good luck to Kathryn and Alan Hughes for a long and well deserved retirement. I hope the negotiations go well for you and all your workers. We will miss you. Did the tour November 5th,last one of 2016.We were lucky to get in and were impressed at the amount of work produced in such a small space.A piece of history has gone,hope someone picks up the reins to keep the bells ringing. I hope the bell foundry survives, albeit in a different location, in which case the bells will keep ringing. More concerning is the possible fate of the existing building in Whitechapel. As many already know, the area is undergoing enormous change and the foundry occupies a prime location. If the building has listed status – which I believe it has – then developers will find it difficult, although not impossible, to demolish it and build yet another depressing profit generating carbuncle. Perhaps Sadiq Khan can get involved before it is sold to another foreign developer who will think nothing of the historical importance or cultural heritage of this site. What a criminal shame. My first contact with the bell foundry was in Perth Australia, their bell tower is graced with a bell made in Whitechapel. My second was in 2012 when I took my then 11 year old son to visit, (it had obtained a special insurance to allow younger children in during the Olympucs!) The tour was amazing and culminated in a bit of a bell ringing experience. We were hooked and from there we were put in touch with St Botolph’s in Aldgate where I still ring every Friday and Sunday (my son has since given up!) I owe the foundary for my new found hobby. Another piece of wonderful history slipping away. Having only recently visited the foundry & been so impressed withe work & the history I am saddened at the decision you have had to make & I so hope the business will flourish in new premises & continue to make history,so much a part of our heritage.I also hope the wonderful building will not be lost. Such sad news an iconic building and industry, please make it into a museum, future generations need to see the great work and pictures of previous generations. 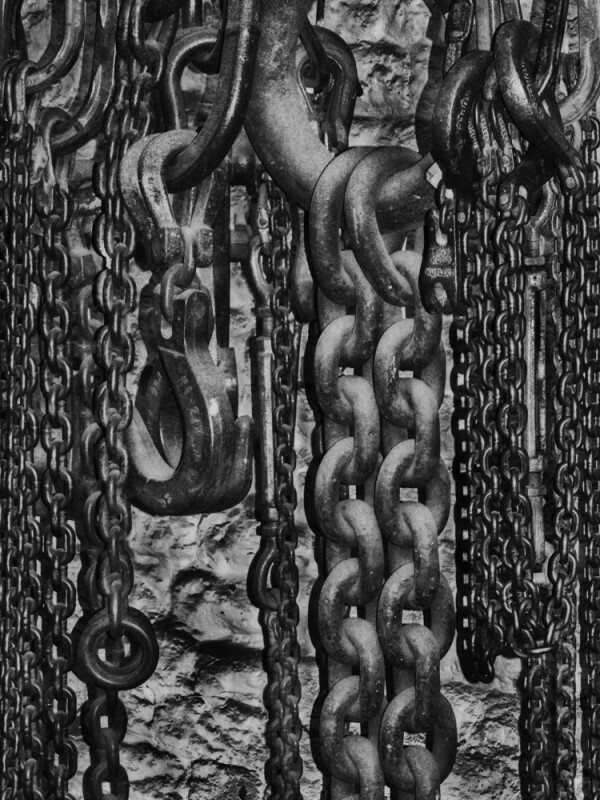 The Liberty Bell, ( the cracked bell in Philadelphia ) is said to have been made by the Whitechapel foundry in 1751 for the Pennsylvania Assembly, and cracked on it’s first ring. It was recast locally, and survived some 90 years before cracking again. I’m sure they’ve gotten better at their metallurgy since, and I’m sorry to hear that they might be closing. My local church in Providence, RI, just celebrated the 200th anniversary of our Meeting House. We are very proud of our bell, the largest ever cast by that famous insurrectionist Paul Revere. His foundry did not survive past the second generation, but his copper company continues on. I have had many conversations with Alan and Kathryn over the years having had our Bells at Masham (Yorkshire) rehung and augmented by them and also involvement with other installations in the area and recently the complete magnificent restoration of our handbells. Alan is an example to all businessmen the world over charming positive realistic honest and never keen on using the word no. I sincerely hope the foundry does carry on elsewhere and the highly skilled workforce carry on producing a fantastic product. Working in a building in reality a museum which really is too small for the work being carried out is not easy, I well remember our casting and the tour which took place and the hospitality given to us that day. Thank you Alan and Kathryn have a well deserved retirement. This is such devastating news. I am an Oliver and my grandfather was the last of the Oliver’s to work at the foundry, which spanned over a 200 year period. I do hope something can be done to preserve the site – and as I live in the area, I wish I could do something to help. Around about 10 years ago Harvington village Handbell Team purchased a two octave set of bells, supplemented a few years later to give us a three octave set of bells. 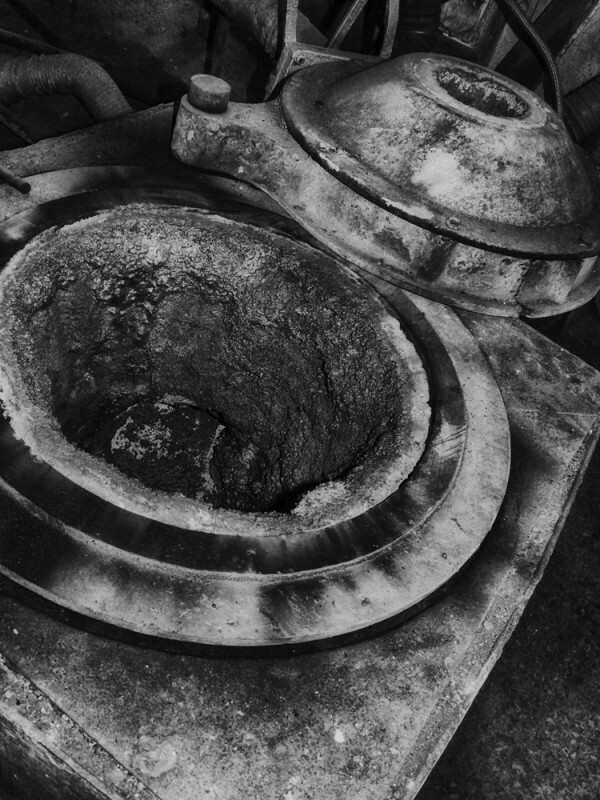 During this period, the team visited the foundry to see where such superb bells were made. We hear, on attending handbell rallys, bells of other manufacturers, but I have to say, that there are no more sweeter, mellow sounding bells than those manufactured to the design and bell metal composition of Whitechapel. This is a sad day, and we can only hope that the sound tradition of your foundry is picked up by others who are as dedicated as you have been to quality. Thank you. We have been making Handbell cases for Whitechapel for many years, Kathryn and Alan are two of the nicest people you could ever meet, we wish them well. It will be a crying shame if the business does not continue, it has been around forever. So glad our family visited two years ago when we were given an excellent personal tour by Alan who, even then, hinted at the family’s difficulties in maintaining the Foundry. His devotion to save the business was very sincere and heartfelt. So sad to hear that another splendid example of British craftsmanship is biting the dust. Despite such a longstanding esteemed history of quality and of worldwide fame I can quite understand the impracticalities of continuing as a going concern. My fear is that, now, the ‘big money’ from developers will forever erase it which would be criminal. This is not only a massively significant site Nationally and Internationally, but it surely must be preserved as a museum and a unique tourist attraction….What American would not want to see where the Liberty Bell was cast !? There seems to be so much cash available for more insignificant/transient projects in the Capital and why aren’t English Heritage snapping up this gem?? Richard Branson, where are you now?! I guess that arrangements for a sale of The Whitechapel Foundry must be well under way and I can only desperately hope that it can, in some way, be preserved in it’s present form. A ‘Blue Plaque’ would be a travesty. I wish the National Trust could buy the property and keep things as they are. Then the Princes Trust could perhaps assist somehow in getting young workers to keep this traditional skill alive. This is sad but the photos you have are outstanding. I hope, like others, that perhaps the building can be preserved. 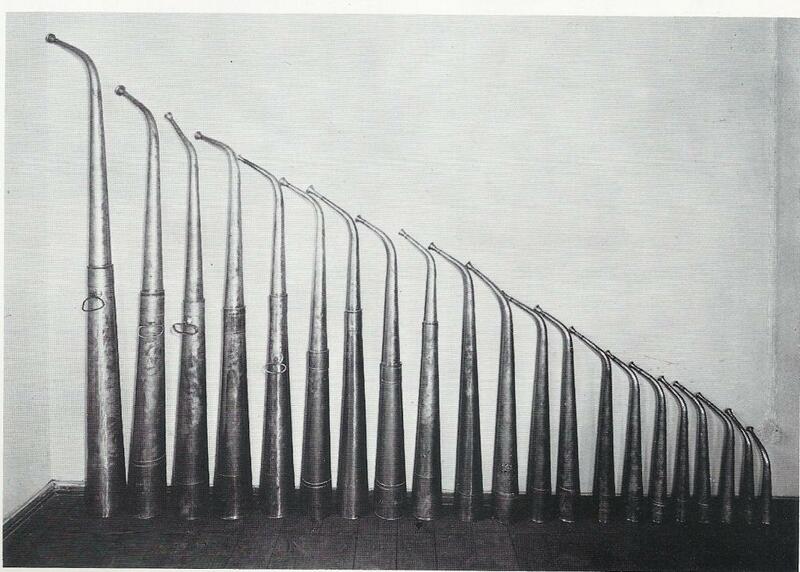 My family’s handbells were cast in Whitechapel in 1877 and are still in regular weekly use and an enjoyment to ring. Ringing tunes on handbells is rapidly mastered by people with no musical background who, from doing so, happily learn co-ordination, team work, rhythm, timing and a sense of creativity and musical achievement. Most new ringers quickly achieve a degree of competence in these facets of music making and handbell ringing is an excellent leaping off point for learning other instruments. I join bellringers everywhere in wishing Alan and Kathryn a long and happy retirement. Definitely agree that the building should be preserved just as it is – museum would be good but even better is the suggestion of The National Trust buying it and keeping it as a going concern with Prince’s Trust apprentices. I mean, its not as if the business itself isn’t thriving is it? I suggest that all of us put forward this proposal to those bodies and ALSO very importantly write as a matter of urgency to The Mayor of London insisting that nothing must be allowed to alter the present building. I fear these days even being listed is no guarantee of protection. Until Government stops dismantling the planning regulations, giving local authorities no powers and putting all the power in the hands of developers, we remain in precarious and treacherous times. As to Mr. and Mrs. Hughes – I do hope you are making it a condition of the sale that the building MUST be preserved and protected in its present state in perpetuity. My introduction to English handbells was sixty-six years ago during a performance on The Garry Moore Show telecast in its first season from New York in 1950. https://en.wikipedia.org/wiki/The_Garry_Moore_Show#Original_version_.281950.E2.80.931958.29 The ringers were based in Brick Presbyterian Church in Manhattan. http://www.brickchurch.org/RelId/606377/ISvars/default/Home.htm The conductress was Doris Watson. http://www.legacy.com/obituaries/mycentraljersey/obituary.aspx?n=doris-watson&pid=175651837&fhid=16591 and http://handbellmusicians.org/memorial/watson/ (Her book on handbell ringing is readily available online at https://archive.org/stream/handbellchoir002231mbp/handbellchoir002231mbp_djvu.txt The original print edition of this book includes a picture of the Brick ringers.) The Church remains in possession of its Whitechapel bells, now silently stored in boxes in a tower closet that remains off-limits. I was immediately enthralled with both the sound and the idea that ringers of handbells played only one or two pitches which, together, formed the whole. The only other way of approaching a complete composition in such a manner with which I was then familiar was that of the Russian horn band, founded in 1750 in Saint Petersburg. https://hornworld.files.wordpress.com/2010/08/bruchle-9.jpg and https://www.youtube.com/watch?v=KrDCZaPWpx8&list=RDKrDCZaPWpx8#t=89. And that’s the point in time during which my interest in handbells, otherwise unknown widely in The United States in that era, began its dormancy. In 1970 a friend of mine who ran his own music shop in Baltimore acquired twenty-five used Whitechapel bells as a part of an estate sale. Believing, quite rightly, that there was no local market for these instruments, he offered the whole two octaves to me for $100! Considering their source and the family recollections he had been given with the bells, our speculation then was that they had been cast sometime between 1950 and 1961. This set later served me, but not always well, suspended individually as a carillon I had designed in 1982. It remained their basic mount until my wife decided in 2009 to buy the entire Whitechapel catalogue of seventy-eight bells for me as a birthday gift. Before her death in June 2013 she significantly enhanced the bell fund to permit me, in continuum, to buy whatever quantity of bells will be required to make this instrument as full as possible. 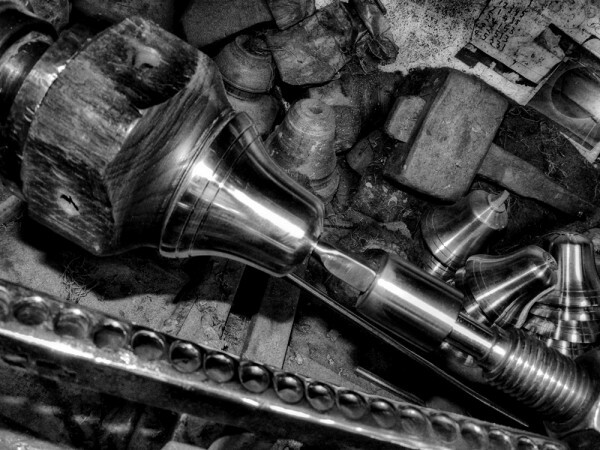 The count to date is two-hundred-forty-one bells; about half of which are in designs and custom pitches unique to this instrument. There are several other distinctive features of this carillon as it’s currently developing. Among them are, First, it’s the only carillon of its kind in the world. Second, singularity aside, when finished it also will be the largest instrument of its kind. The frame from which the entire ensemble is currently suspended is 5’ deep x 8’ wide x 7’ high. Its present form has taken five years (2010-15) to reach. The future? I’ll play the seer here on only one point : Faoiteséipéal go Brách! We recently had our bells restored by Whitechapel. SO pleased and relieved that our funds were raised in time. Thank you to Alan, and to his wonderful team of workers for their amazing work and also for giving us the opportunity to visit the building and witness our bells being caste. Derbyshire is the richer for having such craft and art to cherish. All best wishes for the future. 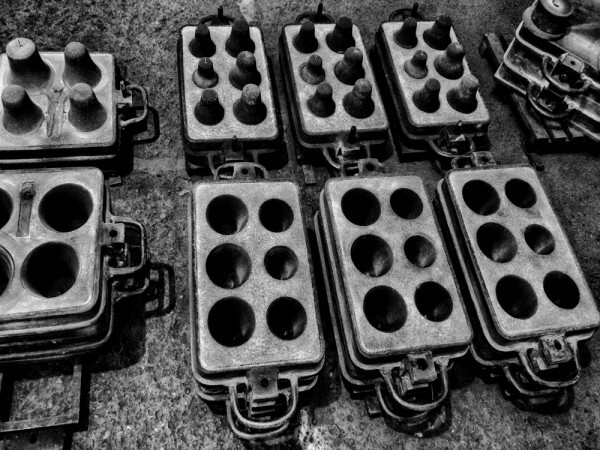 Very sad to hear the bell foundry is closing. I do hope another person/family can take it on! My son is 2 years old and obsessed with church bells. We have been to see our local bell ringers (Christ Church Cathedral in Victoria, BC Canada) and have watched videos of the Whitechapel bell foundry many times. He can talk all about pouring hot metal into molds to make bells. I put the foundry on our ‘bucket list’ for when he’s older and we can visit London. I hope we can see the foundry in action, or at the very least preserved. Whitechapel installed the electric strikers on our four (dead hung) bells in Millbrook, Bedfordshire. Alan personally did the initial survey for the work. His charm and patience made it a pleasure to have met him. I’m very grateful for all the advice he gave us. I wish him and his wife a long and happy retirement together. 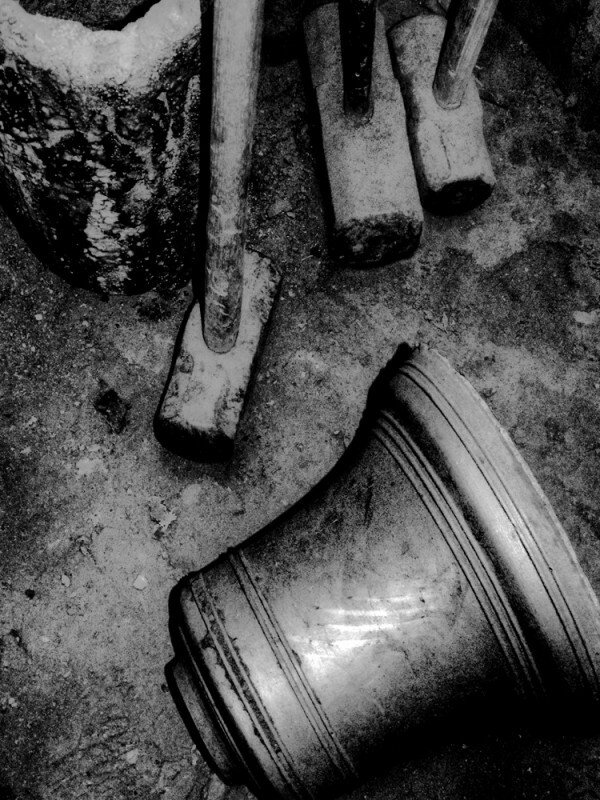 So very sad to hear the news of the closure of the Whitechapel Bell Foundry. As a born East-ender from a family who lived and worked in Spitalfields and Bethnal Green. I often passed the Foundry on my way to Whitechapel Market, it will be greatly missed. On the final day of the foundry all the bells in London should ring in salute. This is rather sad news. 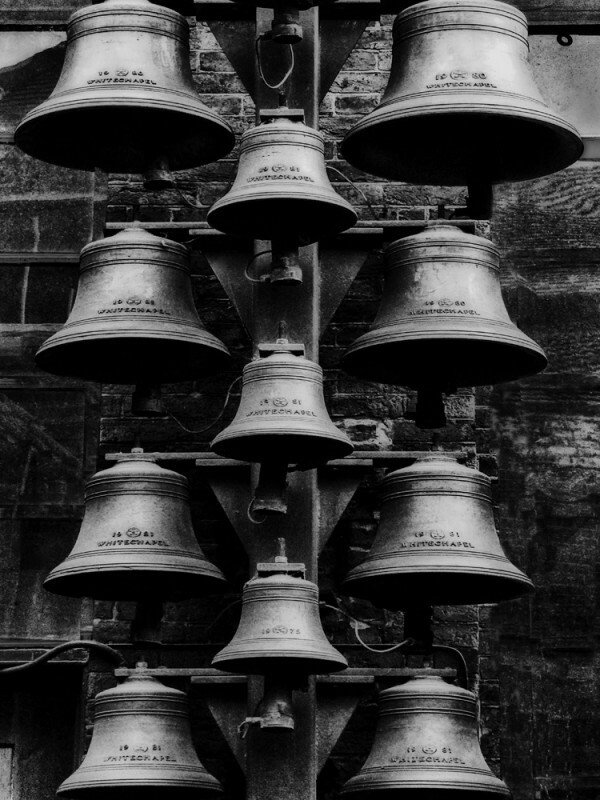 Our 8 bells in Kirkham, Lancashire, were cast here in 1846 and we have a project to replace them with a ten bell ring. Only last week the Mears and Stainbank 8 bells were removed from our Tower. I am delighted to say that two of our eight will live on at Slapton in Buckinghamshire. I found it a good experience when dealing with the people who work at Whitechapel. Although I know vey little about bells and have never been to Whitchaple, I found the above article very sad, another part of out heritage diappering. If the building is listed, as one person has said, then it has some protection. If a enough people could get together and form a trust and run it as a museum as has happened in other parts of the country, at least it would be saved and could enjoyed by the public, as I know very little about the manufacture of bells I would certainly visit it if it became a museum. At least bells will continue to be manufactured, even it it is on a different site. I look forward to hearing good news about the foundry in the near future from one of the many heritage organisations I am a member of. So glad I managed to visit a few times, always spontaneously and regret not to have been able to buy one yet, so wonder if I will get the chance before it closes. The third picture after the text is of a bell from a far East country (can not remember which) which was given as part payment for an order to be melted and recast, but the foundry found it too beautiful to melt again and kept in the yard as a decoration. I wonder where it will end up and if its history will follow. Such a great article, I heard about this from Nicole Fellmeth one of the Rangers from Philadelphia, who is a real historian. Whitechapel Bell Foundry appeared in my book ” Living National Treasures” published in 1997, desparately sad news that this ancient and magnificent business is to close. I recall Danny Matholus explaining the skills and technique of making bells essentially unchanged since the fifteenth century. Surely these unique skills must not die. I’m very late to this but have just read the post. It’s heartbreaking and I echo all the comments above. When so much of old London is being erased and replaced with banal, rubbishy, posturing corporate tat, it’s desperately sad to hear that this quiet corner, so full of history, will pass out of the family’s hands, even if the business will continue (let’s hope it does). I would be very upset if the building too was lost. Very sad to see the foundry closing on its present location but hope it manages to prosper elsewhere. I sincerely hope that the history, documents and artifacts will be preserved in some form of national archive. We are the Anson Engine Museum based in Cheshire, on the site of an old coal mine that closed in 1926 but in our local history collection we are proud to display the colliery bell which was cast at the Whitechapel Foundry and is dated 1835. Whitechapel really should be able to pass on the company and the skills to keep the service into the future. If Bow bells need repair or replacing, who would carry out the work from London. Then if no Whitechapel no true cockneys. Totally unthinkable. When I was a child I lived in Shadwell in a vicarage so often came to visit the foundry. I feel sad at its coming demise, but also worried for the preservation of this amazing Georgian building; it should not be demolished like Georgian King David Lane in Shadwell. It is part of our past culture. I was back in the UK for a month in 1998 to visit family and friends and had a wonderful and memorable tour of the premises from Alan Hughes. My family have also been foundrymen and engineers for generations, both in the UK and also after we came Stateside. It is very sad to think of the closure of this historic foundry. I hope someone takes up the reins and keeps it going in another location. Thank you for your thoughtful and well crafted article, with such fabulous black and white photos! La notizia dell’ imminente chiusura della WBF ci ha lasciato sgomenti perchè forse più di chiunque altro avvertiamo la gravità di quanto starebbe accadendo. Mio marito e suo fratello sono gli eredi di una storica fonderia di campane che porta il loro nome sin dal medioevo e per questo è ritenuta l’Azienda più antica del mondo, la Pontificia Fonderia di Campane Marinelli di Agnone, in Italia. Speriamo con tutto il cuore che si giunga ad una soluzione ragionevole che possa salvare e incrementare la cultura, la tradizione, la simbologia che fanno delle campane i più antichi massmedia e i più alti strumenti di comunione e di pace che si conoscano. Whitechapel non può perdere il suo punto di forza: la sua voce possente che da tanti secoli espande musica e messaggi in tutto il mondo. Abbiamo visitato la Fonderia nel 2014 e poco dopo i titolari hanno ricambiato la loro visita presso di noi per parlare della nostra comune passione. E’ stato bellissimo! Siamo solidali con loro e vorremmo essergli di aiuto e consiglio. 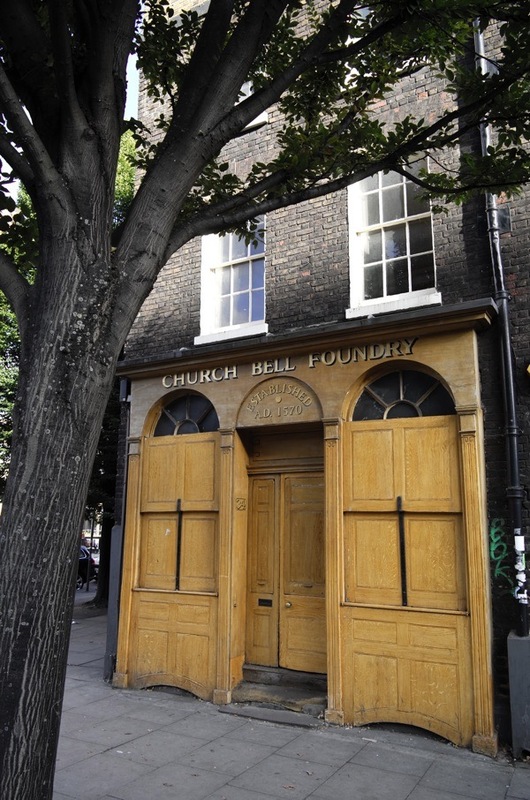 Whitechapel Bell Foundry is moving its location after 250 years. There’s so much history in there and, people can now take some of it with them. We, at GoIndustry DoveBid, are their official auctioneers and we will be auctioning their traditional metalworking machinery equipment and tools they used to manufacture the Big Ben. In the auction lot, people can also bid on clocks and bells which can be dated back to the 17th century. This is the auction listing: http://www.go-dove.com/en/events?cmd=details&event=551136,561246,561243 and it includes English Church Bell (16th Century ), Turret clocks, Victorian Mahogany furniture, etc. Would you be interested in publishing our work on the back of their relocation story? They are using our company because we are based locally and we have years of expertise in the auction scene. I believe I am one of the last Metropolitan Police officers to be presented with a table bell at the end of my service (30/04/17). My colleagues presented me with a bell inscribed with my dates of service last night. I feel honoured. It brought a deep sinking feeling of loss of a beacon of skilled and craftsmanship. 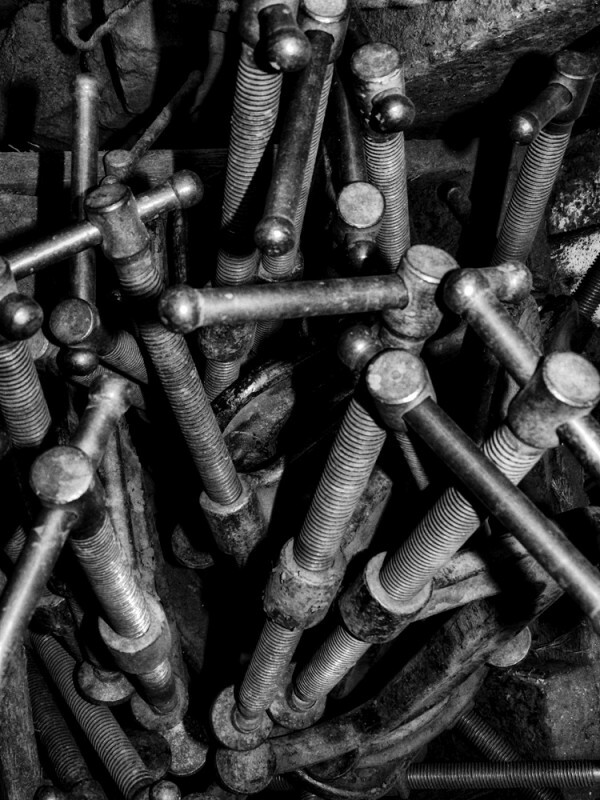 Keep it preserved as a museum to inspire machine trades. So sad to see one of Britain’s most important historic sites being closed. 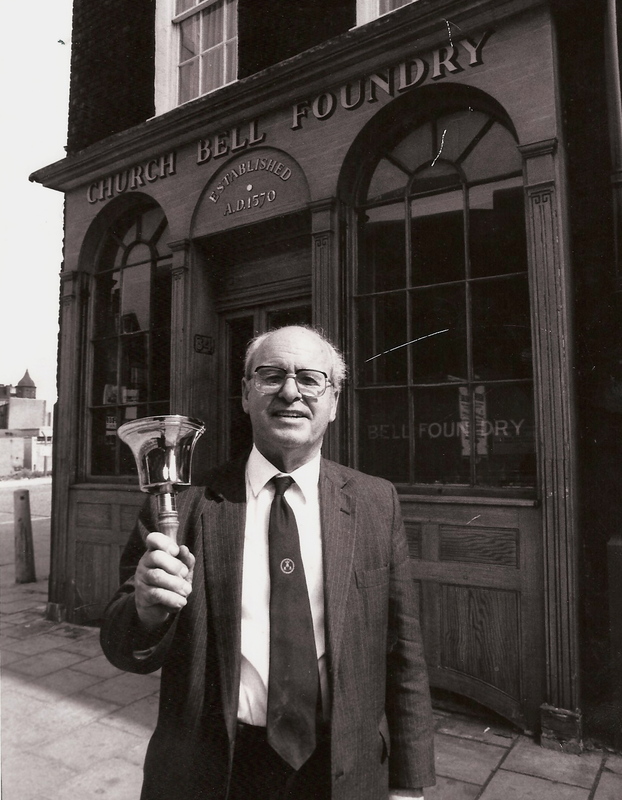 Please follow our website link above for more on Whitechapel’s amazing Bell History. Visit http://www.tower-bridge.org.uk/bells.htm for more history. superb article. thanks for sharing with us. New Malden close to another ex-pupil of yours. The violins still play! 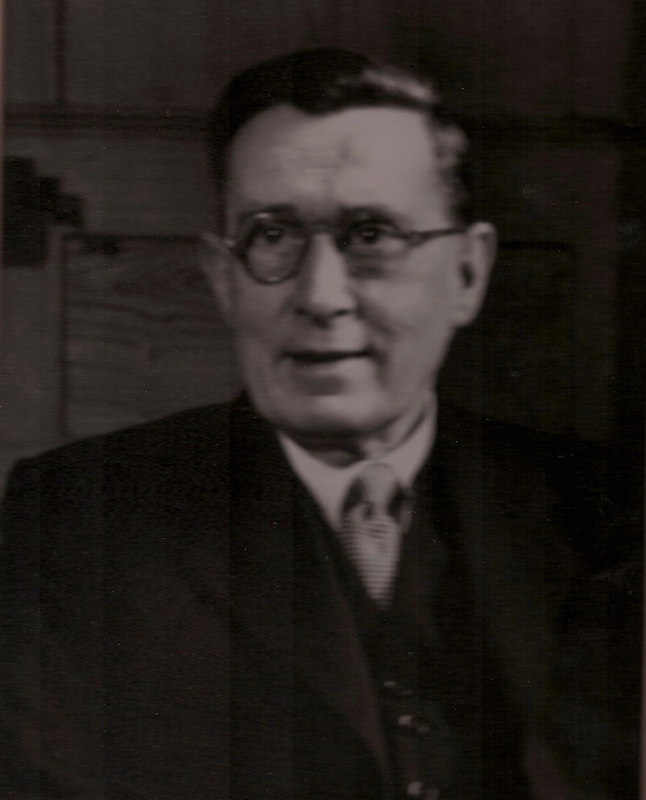 I have only just discovered my 5 x g grandfather was William Mears. I am so thrilled because I started bellringing at the age of 69 four yeas ago and love it. I have always liked the sound of bells, being lulled to sleep by St Ann’s Tottenham’s Whitechapel bells. My family think I am a bit odd with my passion for bells and wonder where it comes from, now I know, it’s in my DNA. I am a Member of the Western Branch of the Yorkshire Associaltion of Change Ringers and also the Halifax Archdeaconry Guild of Change Ringers. I have rung in many towers around the country ( 40), including weekly ringing at 3 local towers and I have done 5 quarter peals but I am a mere novice and intend to continue ‘tll I drop – every week is a challenge with something new to learn; bellringers never stop learning. Is there any way the last owners of the foundry can be contacted and can the public still get a look inside the foundry my ancestor owned and worked ?